Branch Brook Park in Newark (and Belleville) New Jersey has the largest collection of Japanese cherry blossom trees in America, over 4300. They are in bloom now, blush clouds of pink and puffs of white mist. 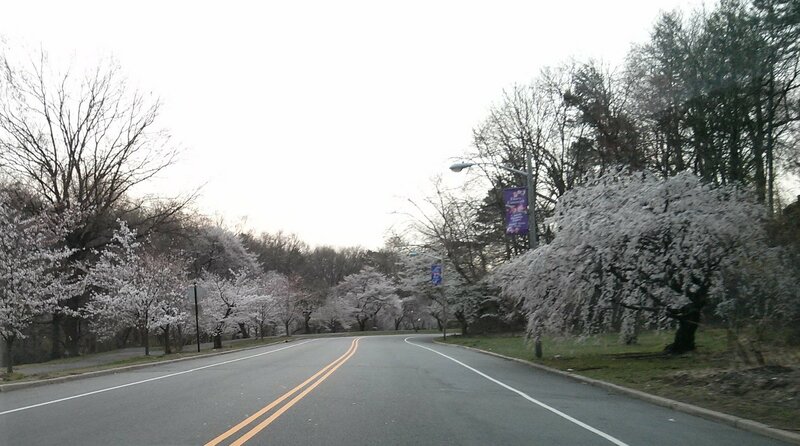 In a few days the blossoms will blanket the ground and the trees will be bare for another season. I wrote about them in “The Forest for the Trees.” In Japan, they are called sakura, and it has been a tradition to picnic beneath the blossoms for well over a thousand years. During the second World War, they became a nationalist symbol, a “blossom of death,” and pilots painted the blossoms on their planes, the final naval battle at Leyte Gulf was a suicide mission to protect the mainland as the ships “exploded like blossoms,” and poets said the thousands of dead young soldiers were “reincarnated” as sakura blossoms. The bombs in Boston had no such beauty. Those clouds of smoke were the voice of cowardice, from whoever detonated them. It is in our nature to pin the blame on those we hate. Terrorist jihadists or terrorist militias, the government, lone psychos, whatever. We will know the perpetrators soon enough. It took months to locate the Olympics bomber from 1996, and a hero’s life was nearly ruined when he was falsely accused. We do not need anger or hatred now, we need calm. And donations of blood. And vigilance without panic. My thoughts go to the victims of this cowardly, hateful attack.